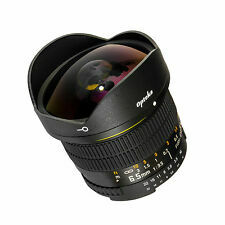 (1) 8mm f/3,5 Obiettivo Asferico ad Alta Definizione Effetto Fisheye per Nikon Compatibilità: reflex digitali Nikon D4S, DF, D4, D3X, D810, D800, D750, D610, D600, D7100, D7000, D5500, D5300, D5200, D5100, D3300, D3200 & D3100. Producono le immagini nitide e chiare in tutte le aperture. 1 85mm f/1.8 Obiettivo per Ritratti per Nikon. AUTO FOCUS. NOTA BENE: Questo è un obiettivo PRINCIPALE MANUALE, il che significa che NON eseguirà. Gamma di diaframmi: f8.3 - f16. - Modalità fotografia: supporta la modalità manuale completa e la modalità collegata alla priorità del diaframma. - La serratura ad anello è progettata per un sistema esterno per treppiedi. Beautiful lens in perfect condition. Nikon Nikkor Lens 35mm, f/2.8, messa a fuoco manuale "AIS". Obiettivo Irix blackstone 11mm f/4.0mm per nikon. Il Irix 11 mm f/4.0 soddisfa i requisiti più esigenti di macchine fotografiche moderne. Irix 11 mm f/4.0 lenti sono realizzate con estrema precisione, consentendo loro di essere utilizzati anche nelle condizioni atmosferiche più dure. Introduction: MEIKE MK-6.5 MM F/2.0 is a fixed manual lens with large aperture, compatible with APS-C format mirrorless cameras. The frosted metal construction makes it resistant to dust and steam while the multilayer nano coating helps over come the problem of flare or fuzzy light. It is highly recommended for landscape, portrait and architecture shooting. Features: * 100% brand new and high quality. * Special for APS-C manual mirrorless camera. * Compatible with Nikon 1. * Multi coated. Delicate experience with multilayer optical coating. * F/2.0 large aperture. * Manual focus ring. There is no auto focusing system in MK-6.5 MM F/2.0 lens. Photographers turn the focusing rings with hands to shoot. Specification: Brand: MEIKEModel: MK-6. Obiettivo Irix firefly 15mm f/2.4mm per Nikon. Il Irix 15 mm f/2.4 soddisfa i requisiti più esigenti di macchine fotografiche moderne. Irix 15 mm f/2.4 lenti sono realizzate con estrema precisione, consentendo loro di essere utilizzati anche nelle condizioni atmosferiche più dure. Focal Length: 55mm. Option: for Nikon DSLR F mount. Gorgeous manual focusing brings you great joy for shooting and makes you focus more on the image itself. Focus mode: Manual Focus. Maximum aperture (F): F1.2. Introduction: MEIKE MK-35 MM F/1.7 is a manual large aperture standard prime, applied in APS-C format interchangeable lens digital cameras. With full lens made of dust and steam proof frosted metal. The lenses are made of multilayer nano optical coating, with no lens flare or fuzzy images. It is the best choice for shooting figures, still pictures and street snap. Features: * 100% brand new and high quality. * Special for APS-C manual mirrorless camera. * Compatible with Nikon 1. * Multi coated. Delicate experience with multilayer optical coating. * F/1.7 large aperture. * Manual focus ring. There is no auto focusing system in MK-35 MM F/1.7 lens. Photographers turn the focusing rings with hands to shoot. Specification: Brand: MEIKEModel:. Con apposito anello (non compreso) è utilizzabile con le moderne digitali DSLR e Mirrorless. Iva compresa nel prezzo. Tamron 70/210mm. f4-5,6 obiettivo manual focus full frame per fotocamere Nikon. Tamron 70/210mm. Compatibile con reflex digitali Nikon D7000 - D7100 - D7200 - D7500 - D200 - D300 - D300s - D500 - D600 - D610 - D700 - D750- D800 - D810 - D850 - D2H - D2Hs - 2Dx - D2xS - D3 - D3x - D3s- D4 - D4s - D5 - DF ecc. Irix 11mm f4 Firefly. LUNGHEZZA FOCALE: 11mm. Coperchio dell'obiettivo anteriore. per maggiori info sui prodotti non esitare a contattarci. È l'obiettivo più leggero della sua classe. FILTRO ANTERIORE: no. Polar lens 60-300 mm. F. 4-5.6 Manual Focus per Nikon. Forniamo sempre la fattura. I prezzi sono da intendersi IVA. L'oggetto si trova nello stato in cui è descritto sopra. Obiettivo Irix blackstone 15mm f/2.4mm per Nikon. Il Irix 15 mm f/2.4 soddisfa i requisiti più esigenti di macchine fotografiche moderne. Irix 15 mm f/2.4 lenti sono realizzate con estrema precisione, consentendo loro di essere utilizzati anche nelle condizioni atmosferiche più dure. Focal Length: 55mm. Option: for Nikon DSLR F mount. Maximum aperture (F): F1.2. Focus mode: Manual Focus. Gorgeous manual focusing brings you great joy for shooting and makes you focus more on the image itself. Polar lens 70-210 mm. F. 4 Manual Focus per Nikon. Forniamo sempre la fattura. I prezzi sono da intendersi IVA. L'oggetto si trova nello stato in cui è descritto sopra. Obiettivo Vivitar 75/300 per nikon ai analogico nuovo mai utilizzato. Focal length: 50mm Fixed. If you do not receive our reply within 48 hours, pls. If you are satisfied with our service, pls. 1 Lens pouch. Color: Black. Nikkor 50mm F1.8 Ai lens. Original Nikon snap fit front lens cap. Lens mount in excellent condition with minor sgns of use. Depth of field scale with infra red index. Non-rotating 52mm filter thread, in excellent condition, ideal for polarizers, grad and square filters. Introduction: MEIKE MK-50 MM F/2.0 is a manual large aperture standard prime, applied in APS-C format interchangeable lens digital cameras. With full lens made of dust and steam proof frosted metal. The lenses are made of multilayer nano optical coating, with no lens flare or fuzzy images. It is the best choice for shooting figures, still pictures and street snap. Features: * 100% brand new and high quality. * Special for APS-C manual mirrorless camera. * Compatible with Nikon 1. * Multi coated. Delicate experience with multilayer optical coating. * F/2.0 large aperture. * Manual focus ring. There is no auto focusing system in MK-50 MM F/2.0 lens. Photographers turn the focusing rings with hands to shoot. Specification: Brand: MEIKEModel:. Nikon AI Mount. Nikon NIKKOR-S 50mm f/1.4 Manual Focus Lens. The focusing ring moves smoothly, not too loose and not too tight. This lens is in good working order. Physically this lens is in used but good condition and shows minor signs of use. Glass nice & bright & clean. in excellent condition. Nikon Nikkor 50mm f/1.4 Super Sharp ai convertiti LENTE. EXC ++++. vedere TST foto. Nikkor 50mm f/1.4 AI Converted Manual Focus Standard Lens. This is an immaculate example of one of Nikon's high quality lenses from the 1970's and 1980's when Nikon didn't make anything except high quality pro lenses. NIKON SERIES E, 50mm F1.8 SEMI PANCAKE LENS, NIKON F Ai-S MOUNT. In full working order, no optical fungus, separation or scratches, there are just the odd few tiny dust specks as usual, good solid example of the famous Nikon lens with lovely bright optics, clean iris blades which adjust perfectly and nice smooth focus action. See AI conversion notes below for more information. Nikon (Nikkor) OC 35mm f/2 AI Converted Manual Focus Lens. See Test Pics. This isn't a factory AI conversion. However, you don't get a secondary aperture scale. See Test Pics. We can therefore be pretty confident that it was made around November 1975. This is a beautiful early example of the classic Nikkor lenses from the 1970's and 1980's when Nikon didn't make anything except high quality pro lenses. Very nice Nikon NIKKOR lens Optical condition very good front & back, no obvious blemishes No fungus / no haze Minor specks of dust visible within the lens with aperture blades open fully (pictured) Externally good condition with some minor cosmetic marks & dust on the barrel of the lens Blades are clean & operational at all settings. Collector's Classic. See test pics. It was made about half way through the production run, so we can be pretty confident that it was made at the first quarter of 1972. It's a collector's classic as well as being a fully functioning and excellent lens. Focal Length: 60mm / 2.36in. Option Types: For Canon-E F mount, For Nikon-F mount. If you do not receive our reply within 48 hours, pls. If you are satisfied with our service, pls. Aperture: F2.8-22. The magnification range is from 0.1x to 2x. Focal Length: 60mm / 2.36in. If you do not receive our reply within 48 hours, pls. If you are satisfied with our service, pls. Aperture: F2.8-22. 1 x Storage Pouch. Nikon 50mm F/1.4 NIKKOR-S. C Auto Pre AI Manual Focus Lens. Fully checked and tested ready to use. Two Months Warranty covering parts and labour. UK & N-Ireland:FREE. Focal length: 50mm Fixed. If you do not receive our reply within 48 hours, pls. If you are satisfied with our service, pls. The unique charm of the manual lens allows you to focus more on the image itself! Nikon Nikkor 50mm f/1.4 Ai LENTE. EXC + COND. fantastico obiettivo standard veloce. Nikon Nikkor 50mm f/1.4 Ai fast standard lens. A fantastic lens in good EXC condition. "This lens has just about the best performance you can get for your Nikon.". See this for more on this amazing lens. Nikon fit 500mm. Film or Digital Manual Focus. Will work on most DSLR's in manual focus. Focus is smooth. VERY GOOD, SEE PHOTOS AND READ FULL LISTING FOR DETAILS. Note this is the more desirable AIS pancake version. In excellent condition with only minor signs of use. Nikon (Nikkor) 35mm f/2 AI Manual Focus Lens. Near Mint. See Test Pics. This is an excellent example of one of Nikon's high quality AI lenses from the late 1970's and 1980's when Nikon didn't make anything except high quality pro lenses. The magnification range is from 0.1x to 2x. Focal Length: 60mm / 2.36in. Lightweight and practical, a good alternative for expensive lens. Allow you to shoot farther view without affecting the quality of images, supports manual focus, free to adjust it for various uses. Vintage Nikon Nikkor 50mm f/1.4 AUTO S AI Supr SHP NON LENTE. EXC +++. vedere TST PIC. On Dropbox, I have uploaded a series of images taken of the underpass from f/1.4 all the way through to f/16 (sequence folder). Notice that there is Vignetting and a bit of Spherical aberration on the bright colours at f/1.4. Sigma 70-200mm F2.8 APO EX HSM. For Nikon Mount -. with cheap third party adapters. 1 xNIKON NIKKOR 135mm 1:2.8 Lens. NIKON NIKKOR135mm 1:2.8 Ai-S Lens. 1 x generic 52mm Nikon Lens Cap. Integrated lens hood. 1 x generic Rear Lens Cap. Condition:Well used. Rest of the World. The Lens is fully operational. Tamron SP MC 35-210mm f3,5-4,2 Nikon F mount. In excellent EXC condition. Includes Hoya lens hood, Skylight filter, manual and case. Nice smooth focus and zoom action. Lenses may have dust and minor optical blemishes, which wouldn't affect image quality. Nikon Nikkor 24mm f/2.8 AI SUPR SHP MN 'L FUOCO AI Lente. EXC ++++ vedere TST foto. This is an immaculate example of one of Nikon's high quality AI lenses from the 1970's, 1980's and 1990's when Nikon didn't make anything except high quality pro lenses. We can, therefore, we can be pretty confident that this lens was made around March 1977.